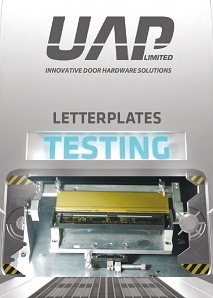 The UAP 300mm 12 inch DOORMASTER letterplate is ideal if you are looking for a more modern and contemporary letterplate. 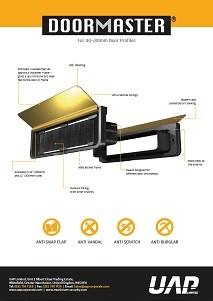 The DOORMASTER letterplate range consists of an enclosed, rounded flap set against a shallower frame, giving a less intrusive but sleek feel to the door or frame. 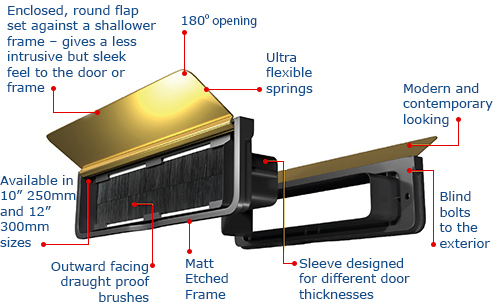 Each DOORMASTER letterplate has a central sleeve, meaning that it can fit in waste (mid) rails. The cavity dimensions also mean that you do not need to change CNC machines routing dimensions in order change over to this modern letterbox. The cavity hole dimension to drill into your doors in order to fit the 12 inch DOORMASTER letterplate is 258mm x 42mm.